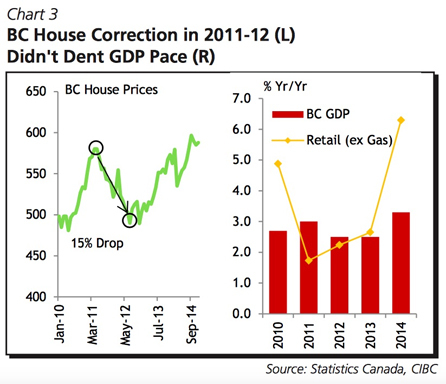 Should we actually fret about a Canadian housing correction? There hasn’t been any shortage of incendiary headlines lately suggesting the Canadian housing market is teetering toward the brink. “Pop Canada’s housing bubble, before it pops the economy,” the Globe and Mail’s editorial board recommended this past weekend. “How Canada’s real estate market went completely insane,” reads a recent explainer care of Canadian Business. A recent CIBC report adopts a brighter tone suggesting a housing market downturn might not be anything to “fear” after all — it comes down to the specific circumstances. “The economy-wide consequences of a house price correction would largely depend on what triggered it in the first place,” write CIBC economists Avery Shenfeld, Andrew Grantham and Nick Exarhos. If current historically low interest rates — which have kept homeownership within reach for some households even as house prices soar — began a fast ascent, property values would almost certainly tumble, the authors acknowledge. But the CIBC economists say if the Bank of Canada hiked its overnight rate, which influences variable mortgage rates, it would ride on the shoulders of a strengthening economy. “There’s a lot of room for better exports and business capital spending to pick up the slack,” the economists note. The central bank has held rates steady amid uncertainty and sluggish economic growth. The CIBC report also suggests a devastating US-style housing crash doesn’t appear to be on the horizon for Canada. 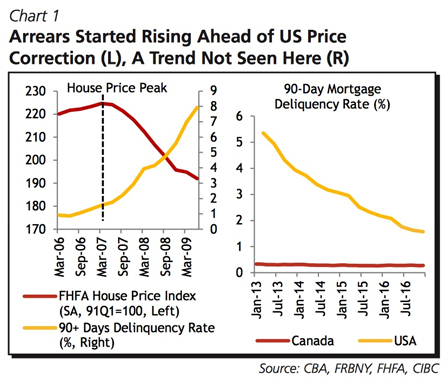 Whereas mortgage arrears began rising prior to a collapse in home prices stateside, the 90-day mortgage delinquency rate north of the border has remained level in recent years (chart below). Similarly, the share of Canada’s six biggest banks’ income assets that is made up of uninsured mortgages has been consistent since the end of 2012, according to CIBC research. “One of the triggers for the US housing crisis, poor mortgage origination standards, looks to be less of an issue here,” Shenfeld, Grantham and Exarhos write. “That owes largely to tighter control over the vast majority of mortgages that come from regulated institutions,” they argue. The report also examines a scenario in which home prices either plunge as confidence in residential real estate dries up or future policy measures are too effective in cooling the housing market. “Major retreats are actually hard to find in Canada or abroad in the absence of at least some interest rate pressure or a recession as a trigger,” the report states. In 2012, Vancouver home prices plummeted by 15 per cent annually, but BC’s economy chugged along. The massive drop only set home prices back roughly to where they were at the beginning of 2010. “While there was some slowing in retail sales, GDP growth was little changed compared with the year earlier,” the economists say, nodding to another chart (below). In the Greater Toronto Area, which saw the average price for homes of all types catapult 33.2 per cent on a year-over-year basis in March, a drop back to levels seen two years ago would be larger, percentage-wise. “But [the BC example] does suggest… the easy-come-easy-go nature of the wealth swing reduces any spillovers into the broader economy,” add the CIBC economists.